Ever watched your cat napping when it’s chilly? You know, repeatedly trying to curl into an ever-tighter ball, but only succeeding in going round in circles?! I know. Cold with all that fur? Weak! (mee-oww!) But anyways, thanks to this super-duper-dwelling called the Only Heated Outdoor Cat House, kitty don’t have to be a house cat all winter. Billed as THE ONLY place for cool cats to chill cozy up outdoors, the Only Heated Outdoor Cat House features a removable 20-watt heater inside its soft and luxurious, foam-lined waterproof floor – generating warm radiant heat to help frosty felines get warm and comfy between ‘ventures. 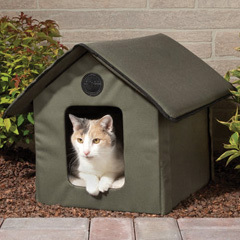 Covered in durable 600-denier nylon backed with waterproof vinyl, and featuring a pitched roof that overhangs all sides to keep kitty dry during showers or snow, the Only Heated Outdoor Cat House includes front and back doors for walk-thru warmth, simply plugs into AC and is available now from Hammacher Schlemmer for $129.95. « RhoadesCar ComfortRide Bike Car: The SUV That Gets You Fit!